Just decide if you want off the shelf or personalised wristbands. There could be several things that could influence your choice – quantity required, whether they are all the same and how much time there is before your event. 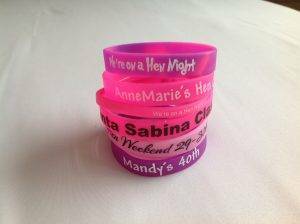 We have pink / purple mixed coloured silicone wristbands already produced with the text ‘We’re on a Hen Night’. These are available now and there is no minimum order quantity. We offer 2 types of wristbands. Depending on the quantity then you can choose from either customised silicone wristbands or our ribbon wristbands. Silicone Wristbands require a mould to be produced, so for this type of wristband, there is a minimum order quantity that would be required to make the order economic to produce and enable us to provide the wristbands at an economical price. All the wristbands would need to have the same message. Delivery takes about 10-15 working days once the artwork has been approved for the wristband. To order our personalised silicone wristbands then you need to send us the details of the type of wristband, colours, text and quantity and we will send you a personalised quotation. Once you agree the price then we will send artwork for your approval. Ribbon Wristbands – are made from our narrow ribbon which we can print for you with any text. Because these are printed on ribbon , there is no minimum order. If required the text can be different on each of the wristbands. This also means that because of the way in which these wristbands are produced you could actually have different text on each of the wristbands. Also different colours if required. We have a good selection of narrow ribbon in stock at all times, and so we can normally despatch your order within 48 hours. As wellas our wristbands we also have a great selection of badges, sashes and rosettes.